This weekend was I given the task of setting up a Panasonic DP-CL22 Color Laser printer for my wife's families home of networked Macs. Their old setup had their printer connected via USB to PIII Compaq, which worked fine except no other computers could print to it. When the new iMac came equipped with with WiFi, we decided to utilize the DP-CL22's ethernet interface to facilitate network printing. The default password for the DP-CL22's web interface is apparently either "0000" or "00000000" depending on the source you believe, accompanied by the default user name of "root". Someone must have changed it along the way and I found no documentation on how to reset it. The DP-CL22 manuals were of no help to me although the Network Setup documentation might be of help to those troubleshooting network configuration errors. The DP-CL22 network setup tool was useful put required I know the old password before setting the new one. The printer is evidently only distributed overseas as the only DP-CL22 drivers I could find were from Panasonic's Japanese site and a search on Panasonic's support site revealed nothing. The DP-CL22 drivers provided by Panasonic don't seem to work properly... whenever I sent a print job to it, it spit out a bunch of blank pages and one page with some garbled "Adobe 3.0..." header text. At this stage I started to play around with the various "Generic PCL" drivers available in the OSX printer setup system preference pane. I tried using "Generic PCL 6/PCL XL Printer - Gutenprint v.5.1.3" driver with some success (it actually printed!) but the documents would not print in color. Apparently the the Gutenprint drivers I was using did not support color printing, but Gutenprint pointed be in the right direction. When adding the printer, make sure the protocol is "Line Printer Daemon - LPD"
Make sure your printer IP is static, or has lease time of forver on your DHCP server or router. Once you type in the IP, under the "Print Using" drop-down, find "HP Color LaserJet Series PCL 6 CUPS". That should be it. Now, when you print from within an application, you can choose the various color options from the "Printer Features" drop-down selection. One final note: don't use the Panasonic supplied ColorSync profile. I did a few test prints and the "Automatic" setting better approximates the colors (evident in purple color printing). Hope this saves someone the hours I spent this weekend trying to get it to work! UPDATE: The above method does not work for printing PDFs... you'll probably get an error like: PCL XL Error. Subsystem: KERNEL. Error: ExtraData. Operator: ReadImage. Position: 19. To fix this, make sure your printer is using the "HP Color LaserJet 5 Foomatic/hpijs" driver instead of the "HP Color LaserJet Series PCL 6 CUPS." You may have some issues with color accuracy, so play around with different color profiles until you find the best match. Thanks much, I used this method to get a Dell 2135cn color laser printing in color from two Macbooks. Ian, which printer did you select that worked with the dell 2135cn ? 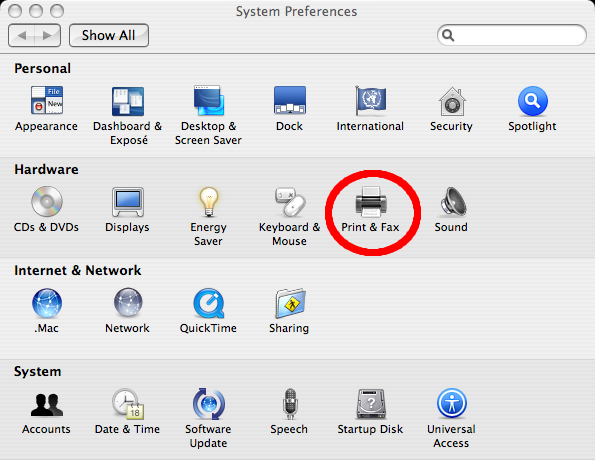 Once you type in the IP, under the "Print Using" drop-down, find "Generic PCL Laser Printer".